This is one of the toughest tours offered to MAP by Peru Motors, and visits 3 South-American countries. During this tour you will conquer the mighty Andes on your bike, see the Atacama-desert, the biggest Salt Lake of the world, count the numerous volcanoes and visit the highest navigable lake on earth: Lake Titicaca. Arrival in Lima and Arequipa - The first day you will arrive in Lima, the sizzling capital of Peru. 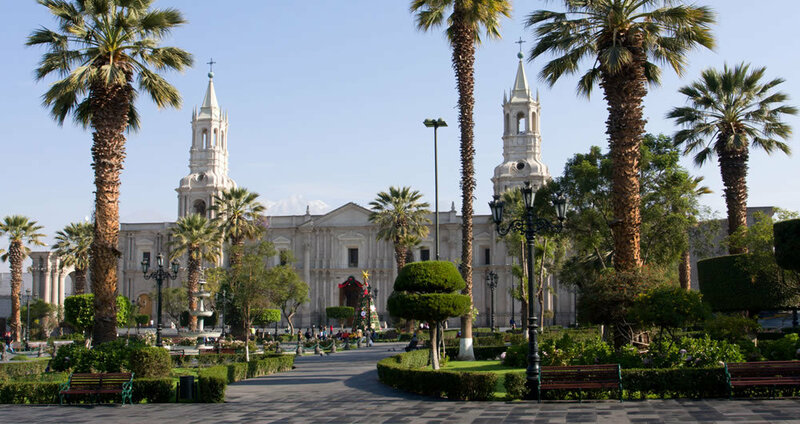 The next day you take your flight to Arequipa,.Here we will brief you about your tour. 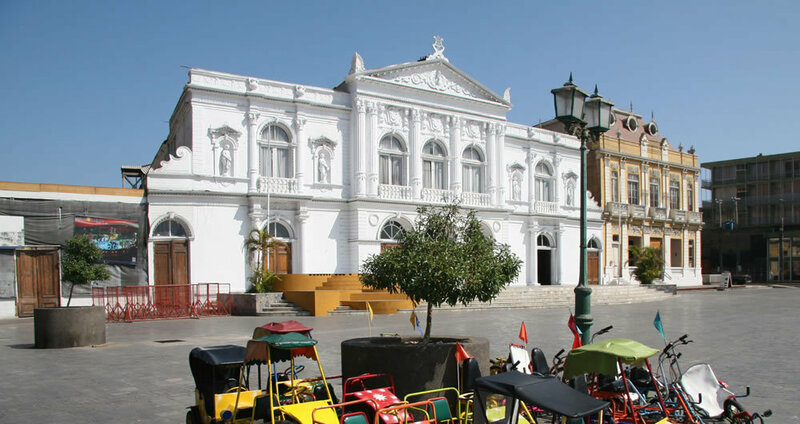 The rest of the day you can stroll the streets of Arequipa and visit the famous Plaza de Armas and museums in the white city. Arequipa - Puno - Finally we leave Arequipa on our motorbikes. A good ride to start the tour over the mighty Andes to Puno on the shores of Lake Titicaca. The last 40 miles will be on a gravel-road. Just to get used to it. 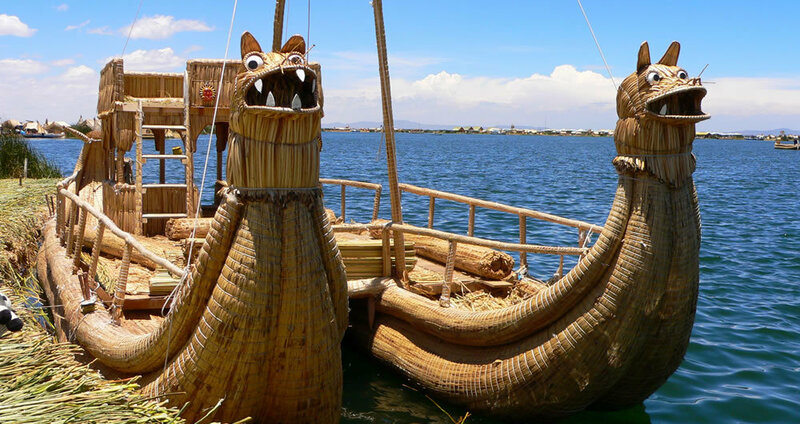 In the afternoon we take the boat to the floating Uros-islands in the highest navigable lake on earth. 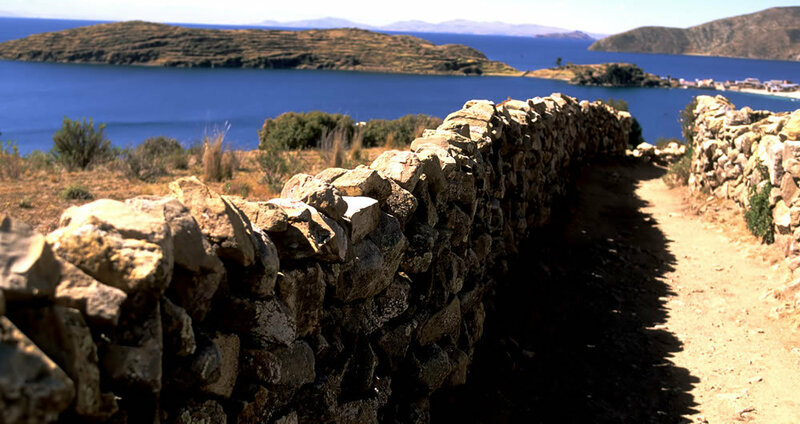 Puno - Copacabana - Along the shores of Lake Titicaca we ride to the border with Bolivia. After all the formalities we stay in Copacabana. Copacabana - Coroico - Through La Paz we descend to the jungle of Bolivia. But first we have to win the Andes mountain range again to climb up till around 14,000 feet (4.100 meters) to drop down from the icy cold glaciers to the hot and sweaty rain forest at 3,000 feet. We will stay 2 nights in the village of Coroico. On day 6 you have the time to enjoy the jungle life with excellent walks around the hotel. Coroico - La Paz - After we have ridden a piece of the "most dangerous road in the world", we ride to La Paz on a great highway into the old city-centre of La Paz. Here you will find the 'Witch-market' and you can visit the "Valley of the Moon", a colourful valley just outside La Paz. La Paz - Oruro - Potosi - The morning is to spend in La Paz. In the afternoon we leave for Oruro. Then the last piece of asphalt (for the next days!) brings us to once the richest city of South-America, but still the highest city on earth with over 13,500 feet (4.100 meters). The spaniards robbed the city of its wealth and left the city poor! Most of the population of Potosi try to make money form silver-mines in the 'Rich Mountain' (Cerro Rico), under very hard circumstances. With a visit to the mines you can help the miners to make their lifes a little bit more pleasant, with your presents. Dynamite is in this city very normal, you can buy it, between the bananas and milk, in many shops. Potosi - Uyuni - Today again a perfect motortrip to Uyuni. All the 160 miles are dirt road with beautiful and very colorful surroundings. 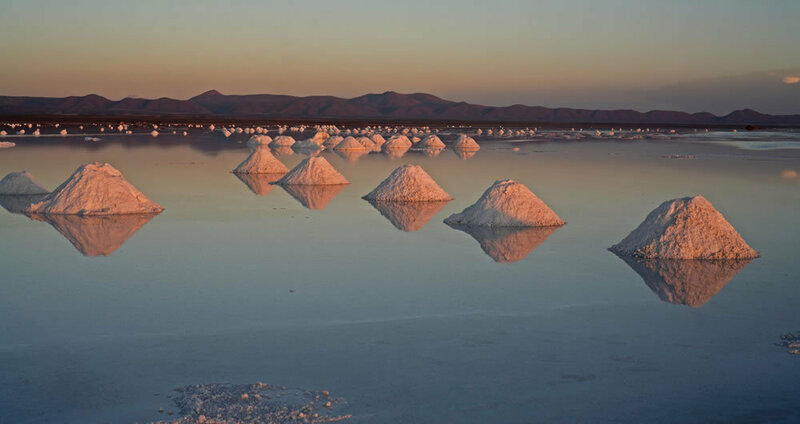 We spend the night in the quiet little town of Uyuni on the shores of the worldfamous saltflats. The biggest in the world! Uyuni - San Juan - The highlight of this tour: the saltflats of Uyuni (Salar de Uyuni). Millions of years ago these flats were seas connected with the ocean. Nowadays these flats are on 13,000 feet (4.000 meters). We will visit the world-famous Salt-hotel. Everything in this hotel is made of salt, the walls, the reception and even the beds. And we will visit Fish-island (Isla de Pescado) in the middle of the salt-flats. After the relative luxury in the last days we move to the poorer highlands into the Andes. We stay the night in a basic hotel in San Juan, a little town without any tourists. San Juan - Calama - Over different salt-flats we go to Ollagüe, a nice "pueblo" on the border of Bolivia and Chile. But first we have to cross the border with Chile surrounding by colourful and countless volcanoes, lama´s, dirt roads and white salty lakes. And further off-road to Calama - Chile. This town is famous of the biggest open copper-mine in the world. If there is some time left, we can visit this mine. Day 14 and 15 --- Calama - Iquique Through the vast Atacama-desert we take the road to Iquique. Sand, sand and even more sand, but the views are spectacular under a blue sky. In Iquique you have a day at leisure to spend to swim in the Pacific, drink a cool beer on the beach, jump of the cliffs with a parapente or visit the largest tax-free shopping-mall in South America. Iquique - Arequipa - From Iquique we take the PanAmerican Highway northbound to Arica, a lifely and furtile little town on the Pacific-coast, 20 kilometers from the border with Peru. Here we will stay the night. The next day we have to conquer again the border-bureaucracy and we can enter Peru. The 'PanAmericana' takes us to the 'Copper-capital' of Peru, Moquegua. A quiet little town in the middle of the desert. Arequipa - Chivay (Colca Canyon) - From Arequipa again it's a wonderful ride to the Colca Canyon. We stay the night in Chivay at the beginning of the canyon. To get into Chivay we'll have to cross a high pass in the Andes of more than 16,000 feet (4.910 meters). High in the Andes you will see no less than 9 volcanoes. In Chivay we can enjoy the thermal baths. Chivay (Colca Canyon) - Arequipa - First we will visit early in the morning "Cruz del Condor" in the deepest canyon in the world, the Colca Canyon. This is one of the best places to spot the Andean Condor in the wild. Then we hit the tarmac and slowly comes Arequipa in sight. In the evening we'll enjoy a cold beer and a alpaca-steak in one of the many restaurants and bars in the centre of Arequipa. Transfer to Lima - In the afternoon we will bring you to the airport of Arequipa for your flight to Lima. 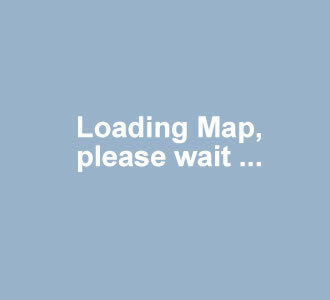 In Lima you will catch your intercontinental flight home.